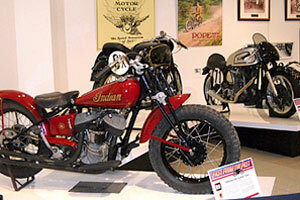 In June 2009, the inaugural exhibit at the Antique Automobile Club of America Museum in Hershey was replaced with a display featuring historical racing motorcycles. 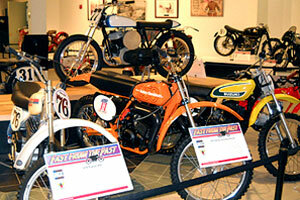 Fast from the Past was designed to show how these machines—and the motorcycle sport—have evolved over the past century. Nine different categories of competition were depicted, from the pioneering days of board-track racing to the highly sophisticated projectiles used for ultimate land-speed competition. The exhibit contained 42 motorcycles from the United States, Great Britain, Germany, Austria, Spain, Italy, and Japan, plus memorabilia such as trophies and posters. The motorcycles and their lenders are listed below. 1937 Excelsior Manxman; Michael Casale, Jr.
1966 Ducati 250 Desmo; Michael Casale, Jr.
1973 Honda Elsinore; Michael Casale, Jr.
© 2007-2019 Antique Motorcycle Foundation, Inc.